Chinese New Year, also known as the Spring Festival, is the most important traditional Chinese festival in China, during which the Chinese people paste couplets on doors, make dumplings and watch the Spring Festival Gala. But in centuries past, how did the Qing Dynasty (1644-1911) emperors celebrate this major festival? Held in the Palace Museum (also known as the Forbidden City), the exhibition “Celebrating Spring Festival in the Forbidden City” provides some insight with 900 pieces (or sets) of cultural relics on display to fully illuminate celebration customs for Chinese New Year during the Qing Dynasty. Imbued with festive atmosphere and offering extensive interactions, the exhibition provides a feast for visitors’ eyes and noses as well. “Just like today, the central theme of Chinese New Year in ancient times involved royal families and ordinary people alike bidding farewell to the past year and welcoming the new one,” explains Shan Jixiang, director of the Palace Museum. “In ancient times, emperors were representative figures of the nation. So, the celebration of Chinese New Year in the imperial palace carried dual meaning for both the family and the nation.” Shan believes that patrons will find items and scenes similar to their own lives, but also plenty of totally new discoveries. During the Spring Festival, each Chinese household posts a piece of paper with Chinese character fu (blessing) on the door. The royal family was no exception. On the first day of the 12th lunar month, emperors would use a brush specially made for the occasion called “Cifu Cangsheng” (literally “bestow blessings on common people”) to write the Chinese character fu on paper referred to as “dragon letter.” It would be posted in the Palace of Heavenly Purity, where emperors lived and dealt with daily political affairs. Then emperors would write another dozen fu to be posted in other palaces. 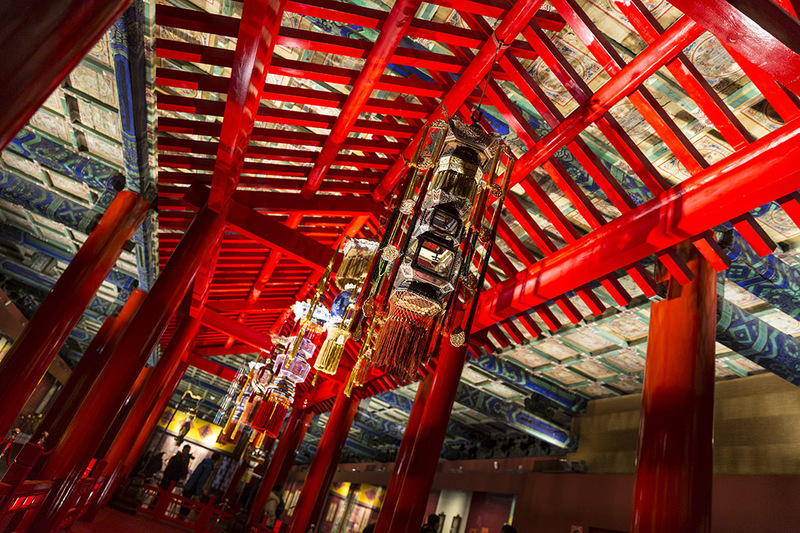 This exhibition showcases the versions of fu brushed by Emperors Kangxi, Yongzheng, Qianlong, Jiaqing and Daoguang, which are expected to bring abundant blessings to spectators. In addition to the fu posters, patrons can see various couplets and pictures of door gods as well as palace lanterns made of varied materials in different patterns, shapes and colors. In front of the Palace of Heavenly Purity stand a pair of “heavenly lamps” and a pair of “longevity lamps,” a tradition that disappeared 200 years ago. Lighting “heavenly lamps” and “longevity lamps” used to be a major event in the early and mid-Qing Dynasty to celebrate Chinese New Year. It took a considerable amount of labor to light and extinguish all the lamps. In 1840, the event was canceled by Emperor Daoguang, causing the grand ceremony to be lost in history and related relics to be scattered sporadically around the world. Fortunately, after reading relevant literature, researchers at the Palace Museum located historical records on the custom and methods and even noted the detailed dimensions of the special lamps. In the storehouse, they found the model for the lamps’ bodies, samples of their links and their original poles. Using these parts, they restored the lamps to enable the special event from the height of the Qing Dynasty to return. The royal family also hosted dinners for Chinese New Year. Following a record about imperial meals dating back to 1783, the exhibition arranged over 200 relics to recreate the settings for family reunion dinners during the Spring Festival. A New Year concert was also held in the imperial palace to mark the occasion. The exhibition features musical instruments used to play the highest-class court music, which would be performed when ministers, senior officials and royal families visited emperors during the festival. Full court music required 18 categories of musical instruments, but only six are exhibited including the bell and drum. In ancient times, an emperor’s every move could influence state affairs. Although emperors would hold a stamp-sealing ceremony to herald the beginning of the holidays, they couldn’t really stop working. The exhibition restored a scene of an emperor beginning his first writing of the new year. The emperor would use a special brush to write some auspicious words on paper to wish blessings for his compatriots. The paper would then be placed in a yellow box which no one was allowed to open. Not until today have people been able to see them. Chinese New Year is not only a family-gathering holiday but also a carnival. Powerful emperors also seized the chance to have fun. The painting Games on Ice depicts skating entertainers performing on the iced Taiye Pond on the eighth day of the 12th lunar month. Watching opera was another major entertainment activity for the royal family. Eight exquisite opera costumes are on display accompanied by musical instruments, scripts, opera paintings and a stage, from which visitors can easily imagine the lively and jubilant scene. In addition to traditional methods, the exhibition also adopts new media such as video, animation, music, projectors, incense and infrared induction as well as many interactive offerings to enrich the visitor experience. With new technologies like virtual images and motion capture, a digitalized pavilion featuring immersive experience is open to whisk people back to the festive Forbidden City hundreds of years ago. Thanks to modern technologies, the exhibition has reproduced imperial celebration activities during the Spring Festival to provide a unique glimpse into imperial life. In this exhibition, cultural relics are no longer removed from their environment but placed in their original historical context. This enables the audience to feel the “life” of the relics and better understand Chinese wishes for the New Year, blessings for the motherland and hopes for life.